Networks are magic. Like bouncing light off mirrors that move to precise positions 96 times per second, getting a particular piece of data from one spot to the next at something called gigabit speeds seems phenomenal. Digital Cinema networks are complex. To explain why would be complex, but we expect that you know why already. Monitoring IP networks is complex. One aspect is straight from quantum mechanics — the Obsever Effect — which notes that measurements of certain systems cannot be made without affecting the systems themselves. In the DCinema world this means that (in your editor's crude attempt): if there is a bottleneck in your system that is causing movies to be transferred slowly from one server to another, you don't want your network analysis system making it even slower. And thus, the NetSec™ Confirm. Designed as a local tool that can poke in quickly to your system to discover errant processes and mischievous malware. Designed with fast ports and very specific analysis software. The buzzword compliant section includes the word "extensible", which in this instance means that the tests can be modified or added to as new tests are created or as your systems personnel learn to take advantage of the system. 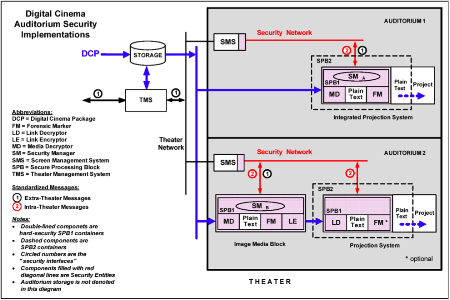 Even if DCinema systems weren't complex, monitoring such a sophisticated and provocative IP network would be important for many reasons. The bad guys only have to find one way in out of a sphere of vectors. You have to protect against incursions from every vector of the sphere. Discussing these many vectors that viruses and trojans and other malware can attack would take longer than the time it takes for new ones to appear. There are even the unintended consequences of governments who create programs like Stuxnet and Flame to break commonly used equipment like Seiman's machine controllers. Let's face it – who knows if they are using some Seimen's device in their system. Machine control code is certainly part of the dcinema game. Intrusion Analysis is the scary term that we would be doing. Network Efficiency would be the other code word, looking at it from the other direction. The important carry away is that this is the tool that your NOC wants to have locally, not sitting off the net poking in. We've built a piece of hardware specifically for this device with fast ports and built in Wireshark on an Ubuntu OS. Only one NetSec™ Confirm per facility is needed.